Do I need to apply to UNE? No. 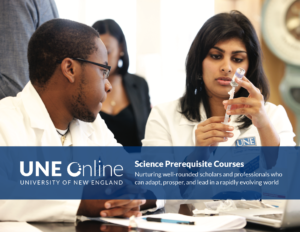 Our online science prerequisites courses are not part of a matriculated degree or certificate program. You can simply register and pay online for the course(s) that you need. Courses begin on the 1st and 3rd Wednesday of every month, with the exception of the first Wednesday in January. Will these credits be accepted by my college, university, or professional school? You are strongly advised to check with someone of authority at the school of your choice to be sure online distance credits are accepted. Do I need to come to the University of New England campus in order to take one of your online courses? No, all courses can be completed online without leaving your home. You can register for any of our online courses 24 hours a day, seven days a week, online. You must be registered for your class by noon (12:00 PM EST) on the Monday before the class starts. To register for a course, please visit our Online Registration Portal. Full payment is due at the time of registration. Be sure to select the correct section with your preferred start date when you register. For step-by-step instructions, please see the Registration Guide. How many courses can I register for at one time? Students are recommended to register for no more than two courses, but are strongly encouraged to take only one course at a time. Do I need to provide transcripts before I can register for a course? No, but it is recommended that you review the suggested prerequisites which can be found on each individual course page. These prerequisites inform you of what content you are expected to know in order to be successful in the course. How can I pay for this course? You can pay for a course using debit card, credit card (Visa, Mastercard, or Discover), or electronic check. Only one form of payment is accepted at this time. Do you have a payment plan for your online courses? We do not offer any type of payment plan at this time. What type of financial aid is accepted? Non-matriculated courses are not eligible for financial aid benefits including federal student loans, scholarships, or grants per the Department of Education. Can I use Military Assistance/GI Bill to pay for these courses? Tuition Assistance - Please submit your Tuition Assistance paperwork to Cathy Mahan via email at cmahan@une.edu. Veterans Assistance & GI Bill® - Please submit your Veterans Assistance or GI Bill® paperwork to UNEVeteranAffairs@une.edu. Military students using any of these benefits will be registered manually through our Registrar’s Office. Additional information about the types of accepted benefits can be found here: une.edu/registrar/veteran-benefits. Students have a maximum of 16 weeks from the official course start date to complete their course(s). How soon can I complete my course(s)? There is no minimum time requirement, courses can be completed at a faster pace depending on the student’s time management and knowledge of course content. The average completion time for most students is 10-14 weeks. Please be aware that these courses are designed to take 16 weeks to complete. How will I communicate with my instructor? All communication with your instructor will occur through course messages in Blackboard or through the instructor’s virtual office hours. How soon can I request an official transcript? Once you complete the final exam, your final grade will be available within three to five business days. You can then request an official transcript from the Registrar’s Office, which will take an additional seven to ten business days to process. You do not need to wait until the official end date to request a transcript. The University of New England has partnered with ProctorU to provide students taking any one of our online courses with the most convenient, at home, online exam proctoring system. This system provides a simple, no cost to the student, secure, online proctor for all of your exams. Exams must be scheduled at least 72 hours in advance in order to avoid additional charges. For further information on scheduling your proctored exam, visit www.proctoru.com/portals/une. Will my accommodations be honored by the University of New England for extended time on exams? Students have a maximum of 16 weeks from the official course start date to complete their courses. All communication with your instructor will occur through course messages in Blackboard or through their virtual office hours. What happens if my course end date is approaching and I do not believe I will finish on time? ● Students are expected to complete all coursework by the appointed end date of the course. ● Students who do not complete coursework by the end date will earn a final grade comprised of completed coursework and zeros reflecting any incomplete assignments/assessments. ● Under very extenuating circumstances and prior to the end of their course, the student may petition their instructor for a temporary grade of Incomplete. Please review our Incomplete Grade Policy. How soon are grades released after the final exam? ● Option 1: If coursework and final exam are completed ahead of the end date for the course, students may reach out to their instructor and request their final grade. ● Option 2: A final grade will be posted within two to three business days of the end date of the course. Final grades can be viewed on your U-Online Student Portal. How can I request a transcript? How long after course completion does it take to order and receive a transcript? It generally takes about seven to ten business days for the transcript to be processed once the instructor has posted the final grade and you have submitted a request to the Registrar's Office. Can I retake a course? Students may retake a course through the science prerequisite program. However, all previous and current grades will appear on a transcript from UNE. All required course materials will be listed in the course syllabus. The syllabus can be found under ‘course information’ in your Blackboard course. 1. 100% refund on or before the official start date of the course. 2. 40% refund within the first seven days of the official course start date. 3. No refund after the first seven days of the official course start date. Can I withdraw from my course? If you are still in the first eight weeks of your course, please complete and submit the Withdrawal Form via your UNE email or fax. A successful withdrawal will result in a grade of W on your official transcript. For any questions, comments, or concerns about your course, please reach out to your assigned Student Support Specialist or the Science Prerequisite Team at prehealth@une.edu.